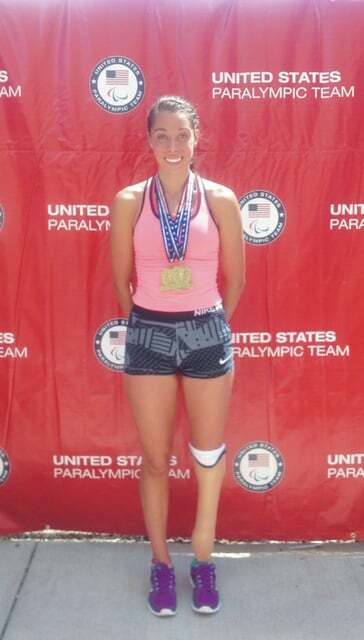 Submitted Photo Jamestown resident Grace Norman competed this past weekend in the U.S. Paralympic National Track & Field Championships at Hamline University, where she finished third in the 200-meter run and won the 400-meter event for her T-44 women’s division. ST. PAUL, Minn. — Jamestown resident and Xenia Christian High School track athlete Grace Norman competed Friday and Sunday in the U.S. Paralympic National Track & Field Championships at Hamline University. On Friday night, she ran the women’s T-44 class 200-meter final against a field of six amputees, which was the largest female field to run. Norman ran a personal-best time of 29.88 seconds, down from last year’s 30.41 time, and took third behind April Holmes, and Liz Willis. In the 400-meter final, Norman started from a 3-point position with help from coach Joaquin Cruz, and took the lead in the first turn and held it, defeating runner up Jessica Heims by more than 11 seconds. Norman’s time was a new PR of 1:03.99. She was very excited as her old PR was 1:05.59. On June 27-28, Norman will be racing in Indianapolis in the Fast Cow Paralympic Invitational with another shot at the 400, and she will also have the opportunity to race the 800 and the 1,500. The event will be held on the Indiana University Purdue University Indianapolis campus. FAIRBORN — The 35th annual Gregg Nischwitz Invitational Tournament wrapped up with the Canes 17U club defeating the Dayton Classics 10-4. The Canes scored five runs in the fourth inning on the way to their win. K.C. Lindon (Middletown Madison) was 3-for-4 with three singles and three runs scored for the Canes. Nate Hiles (Waynesville) finished 3-for-4 with two singles and a doubles with four RBIs. Brian Corbett was walked three times and scored twice. Alec Shanks (Beavercreek) started at pitcher for the Canes. Jacob Banks (Northridge) and Cory Arnold (Hamilton) pitched relief. The Classics scored two runs in the fourth and sixth innings. Alex Firsdon (Centerville) finished 2-for-4 with two singles and an RBI. Tyler Defibaugh (Northmont) was 2-for-2 with a walk and a run scored. Jake McMahan (Carroll) and Nick Elmore (Beavercreek) each finished with a hit for Dayton. Dalton Suter (Centerville), Drew Duckro (Fairmont), Gavin Linkous (Waynesville) and Tyler Phenis (Centerville) pitched for the Classics. XENIA — With 10 wins in the team’s first 14 games of the Great Lakes Summer Collegiate League season, the Xenia Scouts began Monday tied atop the 11-team season standings. They share the top spot with the Athens-based Southern Ohio Copperheads (9-3). Xenia (10-4) was playing a doubleheader against the Northern Ohio Baseball Club in Strongsville on Monday. The Scouts led the first game, 2-1 in the sixth inning, but the team was in a rain delay soon after. The Xenia Scouts will host the third-place Hamilton Joes in a key two-day home series, Tuesday and Wednesday at Grady’s Field, in the Athletes In Action Sports Complex in Xenia. Both games are listed as 7:05 p.m. starts. STRUTHERS — The Bob Cene Baseball Complex will host a wood bat tournament for teams ages 16 thru 19 from across Ohio, June 25-28 2015. Contact Ken Quinn 330 719-0581 for information. ST. MARYS — The Ohio Fury Softball Program will hold its Star Spangled Shootout ASA-sanctioned girls softball tournament on June 26-28 at K.C. Geiger Park. There are 10U, 12U, 14U, 16U and 18U year old divisions. If interested contact Mike Short at 419-738-3795 by e-mail at mshort@bright.net. Entry forms are available on the tournament website at http://www.eteamz.com/ohiofury1/. ST. MARYS — The Ohio Fury Softball Program will hold the Star Spangled Shootout baseball tournament June 26-28 at K.C. Geiger Park. There are 14U, 16U, 18U+ /American Legion divisions. If interested, contact Mike Short at 419-738-3795 or by e-mail at mshort@bright.net. Entry forms are available on the tourney website at http://www.eteamz.com/ohiofury1/. DAYTON — The Bullets baseball program is looking to adding a Kid Pitch 9U and an 11U level team to its existing 8U team in 2016. Players can be from anywhere in the Greater Dayton-Springfield-Richmond (Ind.) area. The teams will train and play their games at the Action Sports Center, 1103 Gateway Drive, in Dayton. Teams will play more than 30 games. Cost is $400 to cover uniforms, practice sites, Midwest Ohio Baseball League games and tournaments. The first tryout will take place from 6-8 p.m., July 9 at Action Sports Center. The second open tryout will be held from 11 a.m. – 1 p.m., July 18 at the Center. Tryouts for 11U will be on Field 4; 9U on Field 7; and 8U on Field 8. Carlisle (9U) at (937) 369-4458 or bulletsbaseball9u@gmail.com; or Tom Slentz (8U) at (937) 673-4826 or bulletsbaseball8u@gmail.com for more details.